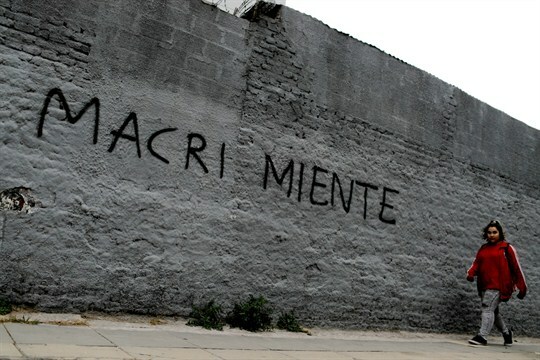 A woman walks past a wall spray painted with a message that reads in Spanish “Macri lies”, Buenos Aires, Argentina, Aug. 30, 2018 (AP photo by Natacha Pisarenko). On Monday, Argentine President Mauricio Macri announced he would further slash budgetary spending and reimpose previously discontinued agricultural export taxes, in an effort to stave off an ongoing currency crisis that has seen the Argentine peso plummet since December. The new measures are an effort to regain investor confidence and secure an enhanced bailout package from the International Monetary Fund. Despite a June deal with the IMF for a $50 billion credit line, Argentina’s currency has continued to depreciate, with the peso tumbling to new lows in the past week. Argentina’s liquidity crisis is the result of a perfect storm of external and domestic factors. With the U.S. Federal Reserve tapering off its quantitative easing program, higher interest rates in the U.S. are siphoning off investment dollars from higher-risk emerging economies like Argentina’s. But domestically, Macri’s unpopular austerity policies—meant to repair the economic damage done by his predecessor, Cristina Fernandez de Kirchner—have failed to translate into the sustained growth he promised. Macri had hoped to pursue his fiscal rebalancing act gradually and counted on the political dividends of a healthier Argentine economy to give him the necessary time to do so. The currency crisis and the sharp economic contraction it has triggered have dashed those plans, amplifying earlier rumblings of popular discontent and raising fears in Argentina that the country might be heading for a replay of its traumatic 2001-2002 crisis. This collection of five WPR articles provides comprehensive analysis and context to better understand this headline news. Will an IMF Bailout Save Argentina’s Macri, or Sink Him? Argentina’s currency crisis has demonstrated that the era of “easy money” is over. From now on, Argentine President Mauricio Macri will need to accelerate economic reforms and bring government spending down as fast as possible in a much less favorable external environment. The government and the IMF want to keep the social impact of spending cuts to a minimum, but it will not be easy, and the political cost will be high. For many Argentines, the IMF was the main culprit of the political, social and economic meltdown of the early 2000s. They link the fund with the “neoliberal policies” of structural reform that slashed public services, plunged the economy into a recession and dramatically increased the foreign debt. Rightly or wrongly, that perception means that turning to the IMF will be politically costly for Macri. Last October, Macri celebrated the triumph of his Cambiemos, or “Let’s Change,” coalition in midterm legislative elections. For Macri, the victory represented a much-needed public endorsement of his agenda of incremental economic reforms, known as “gradualismo.” In Argentina, however, a few months can be an eternity, and Macri is now facing a string of bad economic news, which has increased popular discontent and fired up a resurgent opposition. Macri won the 2015 presidential elections by promising that his plan for economic reforms, though painful at first, would reignite economic growth after years of stagnation and contain inflation, a chronic problem for Argentina. Yet after more than two years, the second part of the deal has not come true for many Argentines, who seem to be losing their patience. Macri’s gradualism simply hasn’t delivered results yet. Argentina’s president, Mauricio Macri, opened the year on the heels of a bruising fight over pension reform, which has galvanized the opposition and sent his approval ratings tumbling. The pension reform is part of a months-long program of tough-love economic policy prescriptions, aimed at tackling inflation and making the nation’s public spending commitments sustainable for the foreseeable future. The government has argued that these changes are a necessary response to more than a decade of underfunding and part of a broader plan to rein in inflation and economic instability. But voters are not rewarding Macri for his avowed sense of responsibility, as his approval rating has slipped to new depths. Except in times of war, few politicians have achieved great electoral success by telling voters to sacrifice living standards today for the sake of a better tomorrow. But in a surprising turn of events in August 2017, voters in Argentina gave an unexpected endorsement to this message, which has been the guiding logic behind the anti-populist policies of President Mauricio Macri. After one-and-a-half years of Macri’s bitter economic medicine, and with former President Cristina Fernandez de Kirchner on the ballot for a Senate seat, few expected Argentineans to gie a hearty vote of confidence to Macri and his Cambiemos—or “Let’s Change”—coalition. But that is exactly what they did. Macri’s Moment: Can Argentina’s New President Live Up to the Hype? In the months after he took office in 2016, Argentine President Mauricio Macri created a buzz on the international circuit, but even then it was clear he wouldn’t have an easy time installing a new paradigm in a deeply divided society. After taking office in December 2015, businessman-turned-politician Macri set about hastily redefining Argentina’s political, economic and cultural landscape. In his whirlwind first 100 days, he dismantled currency and capital controls, slashed export taxes, and settled a 15-year dispute with holders of defaulted debt. Macri and his supporters claimed this was the beginning of a bright new era for Argentina, in which the country would no longer be held back by ideological struggles and would finally reach its potential as a regional or even global power. However, this wave of positivity could not disguise the challenges Macri faced at home, where he had to convince a deeply divided society to support a painful transition. The contents of this report, and of all In Context reports, can be viewed by both subscribers and non-subscribers. But only subscribers can access the full articles when they click through on the headlines above. Not a subscriber? Read on for more information about becoming one. . . .
Get unlimited access to comprehensive analysis to better understand breaking news. Subscribe to World Politics Review and you'll receive instant access to 9,000+ articles in the World Politics Review Library, along with new comprehensive analysis every weekday . . . written by leading topic experts. Critical background to help you understand breaking news is just a fraction of what you’ll get in WPR’s searchable library of content, where you’ll find over 9,000 articles on topics such as international diplomacy, the global refugee crisis, global finance, economic trends, gender equality, water rights, and so much more! And the World Politics Review library is searchable by author, region, and issue, so you can find specific topics quickly and easily! Prepare your business, organization, or institution to stay ahead of the curve by better understanding critical global trends as they emerge and develop. Be first to know how to act upon world events and emerging trends, with our uncompromising analysis and recommendations. Save time following the most important international news and events by reading digested and curated content from the expert editors at World Politics Review. Stay up to date on emerging events and trends so you can take advantage of opportunities for investment, and insulate your business from political pitfalls. Speak confidently to anyone—whether at a work meeting or a cocktail party—about global events and trends, with a perspective that’s intelligent, informed, probing, analytical, and—frankly—quite impressive! Immediate and instant access to the full searchable library of 9,000+ articles. Daily articles with original analysis, written by leading topic experts, delivered to you every weekday. Daily links to must-read news, analysis, and opinion from top sources around the globe, curated by our keen-eyed team of editors. Daily Associated Press wire stories, selected for you by our top-notch editors. Weekly in-depth reports, including features and country- and region-specific reports. PDF versions of all articles for easy offline reading, at your leisure. And all of this is available to you —right now—with a subscription to World Politics Review. That’s right: you’ll get immediate access to all of our uncompromising global-trend analysis that delivers actionable advice for policymakers, analysts, business strategists, academics, influencers, and thought leaders who have a deep interest in international affairs. Get unlimited access to must-read news, analysis and opinion from top experts. Why not join us right now? Thousands of others already have. World Politics Review (WPR) is produced by a vast network of leading experts and influential observers on the ground; our substantive content gives you access to comprehensive and detailed perspectives that are as valuable as they are unique and rare. Though strictly nonpartisan with regard to political-party affiliation or allegiance, WPR relies on a reality-based approach that recognizes the need for all the tools and instruments of statecraft—with a preference for diplomacy and multilateralism in support of a rules- and norms-based global order. WPR’s mission is simple—we’re committed to integrity, quality, and the principles of an intellectually honest press whose exclusive purpose is to inform and educate its readers. Why not join us today and benefit from all the valuable insights you can’t get anywhere else?